The eyes of the country have swivelled to Chile this week and the rescue of the 33 trapped miners. Newspapers, conversation and twitter pages have been alive with tearful Britons watching the events unfold online as the heroes emerge (largely) unscathed, considering their horrendous ordeal. Predictably, ridiculous PR stunts have ensued; the tabloid press leading the way. As one radio presenter, rather cynically, commented, we shall all look forward to the ‘Based on Real Events’ film in time for Christmas 2011. Steve Jobs will give each an ipod, ‘Trapped Miners Invited to Old Trafford’, The Sun reported, The Daily Mail told readers of the Eastender’s-style extra-marital affair of one naughty miner. It got me thinking of how events are perceived in history. 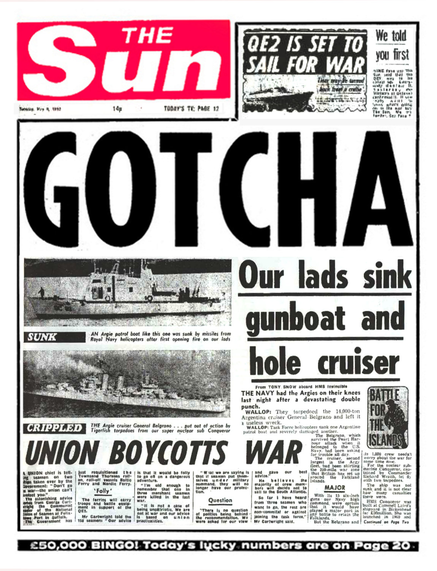 We’ve all seen The Sun’s ‘GOTCHA!’ headline of the middle of the Falkland’s crisis, widely referred to as a turning point for the previously unpopular Maggie Thatcher. It is just this sort of cultural symbol which comes to symbolise a moment, when its effect on people’s daily lives at the time could well have been minimal. Thus some tiny islands, previously geographically ambiguous, came to be seen as a political turning point of a decade. Time shall tell if it will be the case. As Hayden White writes of the story-making instinct of history: ‘The events are made into a story by the suppression or subordination of certain of them and the highlighting of others’, the media, and our history books, come to purport this on a daily basis, more than we realise. This entry was posted in News and tagged Media, News, Tabloid. Bookmark the permalink.